The 1.8-liter R18A engine was presented in 2006 for the Honda Civic. This new R-series was created to replace the old D-series engines. The R18 is a replacement for the D17 engine. It has an aluminum cylinder block and 16 valve SOHC aluminum cylinder head. The aluminum pistons are cooled with oil by piston cooling jets installed in the engine block. The engine got a timing chain instead of a belt as on previous D-series engines. The R18 hasn't hydraulic tappets (checking and adjusting valves are every 25,000 miles or 40,000 km). The valve clearance for intake valves is 0.18-0.22mm, exhaust - 0.23-0.27 mm. 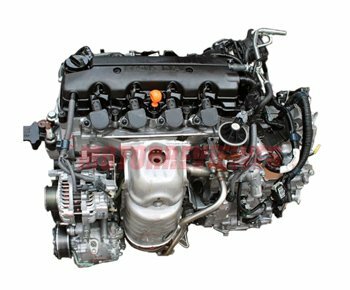 The engine already has the variable valve timing Honda's i-VTEC system. There is a plastic variable length intake manifold also. The R18 engine was modified to achieve more displacement for larger Honda's model such Accord. This 2.0-liter version is R20A engine. 1. The engine knock. Usually, a canister purge valve produces this sound, this is normal. Also If the adjusting of the valves clearances was long ago, possibly the time has come. 2. The drive belt tensioner produces some noise. Its life is 60,000 miles (100,000 km). 3. Vibrations. If an engine is cold, that is ok. But if vibration continues all time, check the left engine mount. Using the recommended engine oil is essential. That will keeps the VTEC system in good condition for a long time. The engine life of R18 is about 180,000 miles (300,000 km). 1. R18A1 - version of the engine for the Japanese and North American market. 10.5 compression ratio, 141 hp, 128 ft lb (174Nm). 2. R18A2 - European version. 10.5 compression ratio, 140 hp, 128 ft lb (174Nm). Produced since 2012. 3. R18Z1 - version for Southeast Asian 2012+ Civic model. 10.6 compression ratio, 141 hp, 128 ft lb (174Nm).